Who Is Safe From the Robot Revolution? Is it time to freak out about the growing role of robots in the economy? The global market for manufacturing and service robots is $25 billion. That's pennies compared to the global manufacturing and service economy, which runs in the tens of trillions of dollars. But as more companies look to automate work, robots will creep into industries previously thought impervious to metal arms and scanners. Let's look at two seemingly invincible sectors: law and health care. "E-discovery" programs can analyze millions of documents to search for keywords and patterns faster and cheaper than human lawyers. Lawyers don't spend 100% of their time on discovery, but "if 50% of a worker's tasks can be automated, then employment in that area can fall by half," writes Martin Ford. In heath care, mobile bots mimic the movement of medicine and meals in more than 100 hospitals. Even better, the new da Vinci robotic surgical system "allows surgeons to view their patients from a high-def, 3D camera and (ideally) make more precise incisions by manipulating robotic arms," Brian Bremmer writes. In the first wave of the robot revolution, bots put human arms at risk. In the next wave, it's our brains that are in danger. Robot technology is climbing the skills ladder and pushing the working man down a rung. 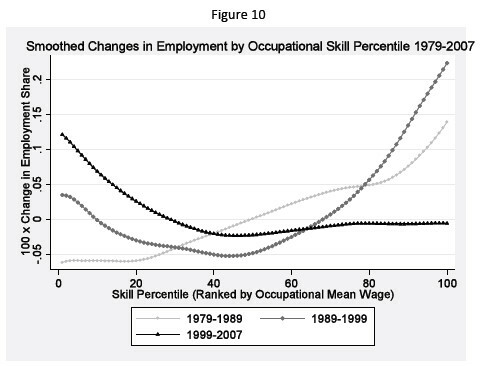 In this graph, from another David Autor paper, we see that in the 1980s, employment grew slowest among the lowest skilled workers, faster among the middle-skilled, and fastest among the highest skilled. In the 1990s, the middle class hollowed out. In the 2000s, however, higher-skilled workers have stopped gaining. What industry will feel the pinch of automated technology next? How will the next generation of bots change the labor landscape? I don't know. There's too much data to sort through. Maybe you should consult a robot, somewhere.